None to shabby for a Wednesday! – A collector / drinker with a passion for most wines and mainly in magnums! – A wine writer and enthusiast. – A Chateaux owner/producer, Wine merchant & Negoce. The venue also helped massively – The Square – as it was on top form. I regret not picturing the food as the Crab Lasagne (a Square classic) and the Grouse (possibly the best I have ever had) were both spot on and complemented the wines perfectly. We started with – Clos de Goisses 1990, Philiponnat – A deep colour for Champagne, almost a slight pink orange hue, I have heard of Clos de Goisses being decanted and as this spent time in the glass I can see why. As with good white Burgundy this grew from a delicately biscuity but quite oxidative nose into something sweeter and easier with time. As the first courses arrived we then had a pair of white Burgundies to contemplate. 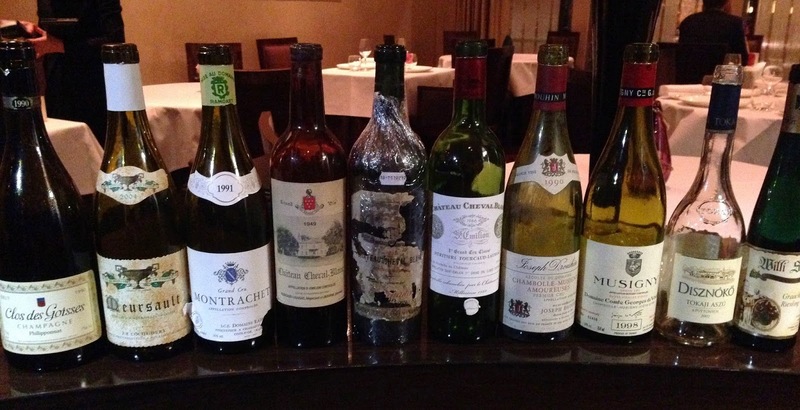 Meursault 2004, Coche Dury & Le Montrachet 1991, Ramonet. A very good contrasting pair. The Coche was a delight, lemon and citric acidity with a small dash of reduction, it’s cleanliness made me think of sorbet. It got better and better in glass but was linear to the end, a young wine but starting to open, very 2004, taught and poised, impressive. Never “just” a “village” wine from that man. The Ramonet was fascinating. I have looked back through the blog and realise now (one of the main reasons to do this exercise!) that I have been very privileged in having this wine from 1988, 1990, 1993, 1994 before. There is a commonality but also the desired vintage variation. The 1991 is a savoury wine to sip and think on, not gregarious or showy. A savoury almost saline hazelnut is in the there as well as tea and pine resin. Traditional and all the better for it…what a start. The next three wines were served blind, all we were told was that there was a link and it quickly leaked out that all these wines were older than everyone at the table. Bordeaux was obvious. There was an even split of guesses for left and right bank. I was one of the wrong ones. 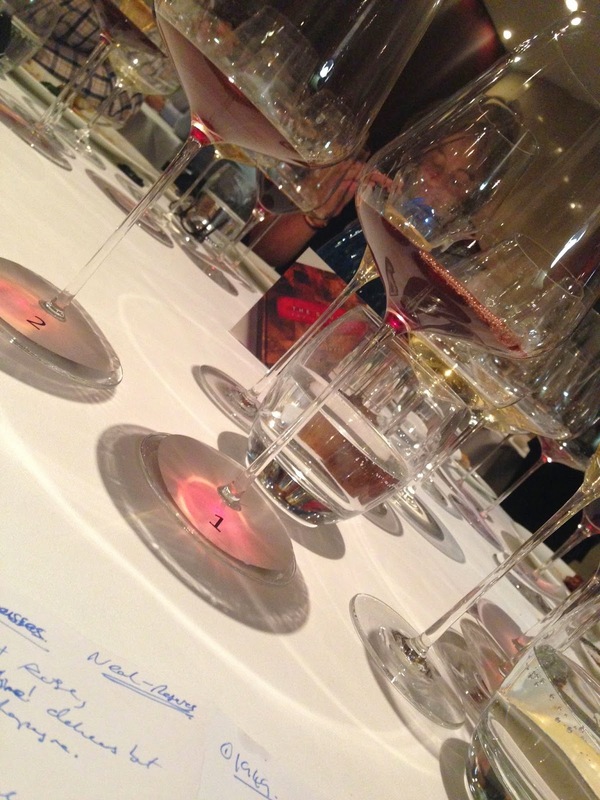 The wines right to left as we drank them were Cheval Blanc 1949, 1948 and 1966. It was great to have three wines showing well, only the 1949 did not show much on the palate but the nose was superb. 1949 was deep in colour with a rich nose, lovely and hard to believe it is the age it is, the palate was just muted and tight. 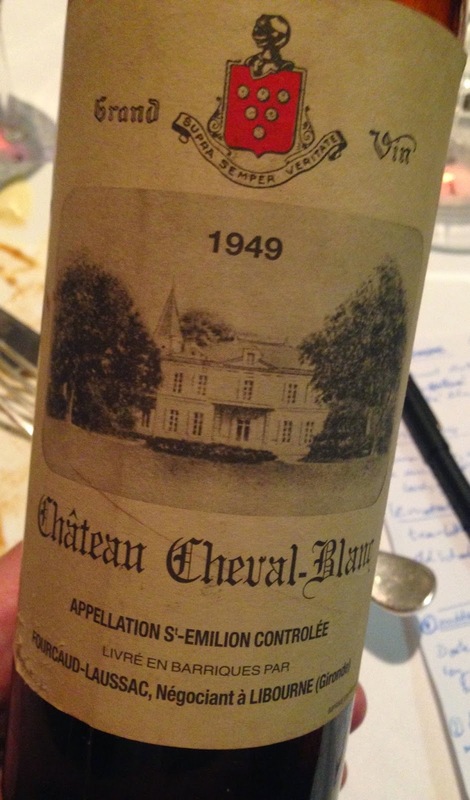 1948 had a high-octane nose of exuberant cherry and compote fruit. There is a volatility that made this so extrovert and a little quirky, there was no way you couldn’t like this wine, spice, herbs and a meaty density on the plate just made it amazing. It only started to fade when there was very little wine left in the glass (a stage I found myself at easily!). 1966 was incredible, cepe and other mushrooms initially but this left with time. There was a darker fruited succulence about this, I so wish that more St.Emilion was like this. Incredibly youthful in colour and wonderful fruited plate. Long and persistent, so complete that it is hard to write about. As mentioned above the Grouse with these older wines was just perfect. The character of Cheval Blanc was there to see, such a great site, it just makes you all the more sad about the pricing of the estate these days. People should be loving this estate and buying it almost blindly ever year but so wrong has been its positioning been that that is almost certainly insanity. Next up was the bottle I took – Musigny Grand Cru 1998, de Vogue – alongside another red Burgundy – Chambolle-Musigny 1er Cru Les Amoureuses 1990, Drouhin. This was a lovely pair, briefly the wines were blind and people got close. I was really impressed by the 1998. I had thought it would be too closed. The 1995 that I had recently thanks to one of this evenings attendees was delicious on the nose but very tight. This 1998 put on weight from the moment it hit the glass, the purity of dark cherry fruit initially was trademark de Vogue. The Drouhin had a lovely soft easy sweetness, “persistent finesse” I have in my notes, fully mature but in a fruited way, really delicious. With several petit fours we had a pair of “sweeties” – Disznoko Tokaji Aszu 2002 6 Puttonyos and Willi Schaefer Graacher Domprobst Beerenauslese 2009. The Tokaji was really good, oranges, creme brûlée and finesse, not too much rancio character but the trade good acidity to lift these flavours. The Schaefer was precise but at the same time generous, a dash of spritz and some real energy, white fruit. To only think that BA etc needs endless time to mature is a mistake, the vast majority are not a waste to drink young. A delicious dinner and lots of good conversation, some quite vociferous as a debate should be…this dinner will live long in the memory. Many thanks especially to our organiser who provided the lions share of these wonderful bottles.